Only a week or two from gaining flight feathers and flying out of the "sanctuary," fifty Canada geese were instead heralded to an upstate slaughterhouse yesterday where their deaths translate into paychecks and guaranteed employment for all involved. -- That is as long as there are still geese in New York City to round-up and kill. 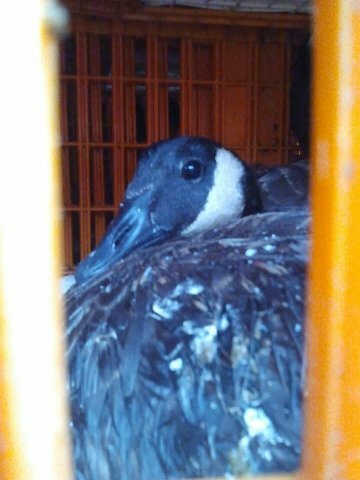 50 geese on a 9,155 acre "sanctuary" deemed unacceptable. But, they are the gift that keeps on giving. The geese who lay the golden eggs for a largely discredited federal agency that prospers and benefits from their demise. Nearly 24 hours later, it was not clear if the geese had actually been slaughtered or were still crowded together in the crates. A member of GooseWatch, NYC (https://www.facebook.com/GooseWatchNYC?fref=ts) called the operator of the facility on the evening of July 10th offering to buy the geese and send them to a sanctuary. Rather than being told, "Sorry lady, the geese have already been processed" (which would have been the normal response if they had been), the caller was told to call the DEC and hung up on. Kroll Farm slaughters and processes both, domestic animals and wildlife. There can be different laws and regulations applying to both and thus it's unlikely wild and domestic species would be slaughtered together in the same time frame. Who knows how long animals have to suffer in confined and crowded spaces before finally being "dispatched" in a comparatively small slaughter operation? It could be hours or in some cases, even days. Once dropping the geese off and collecting a paycheck, employees of USDA Wildlife Services have "done their jobs" and neither know nor care what happens to the animals once they leave. No one seems to actually know or care. One thing we do know for sure however, is that the roundup of helpless, molting (but otherwise healthy) Canada geese jammed into crates and sent to slaughter hundreds of miles from the city is as far from "euthanasia" (USDA's and media's favorite word for the carnage) as the Milky Way is from other galaxies. So, why is it done? In recent years, we have heard all types of justifications for the annual slaughters of our New York City resident geese. From "overpopulation" to "nuisance" to flying into planes. But, none of these wash with regard to what is actually happening now. The Canada goose population in New York City has been decimated during the past seven years in which more than 6,000 geese and their babies have been captured from city parks and a so-called, refuge and either gassed or slaughtered. That there were only 50 geese on a 9,155 acre "sanctuary" to be captured on July 10th speaks volumes to the devastating impacts these ruthless roundups have actually had. The fact is that multiple federal, state and city agencies (as well as politicians) are involved in the decision-making processes and different contracts are signed for the annual slaughters. All have their hands in the toxic pie, but no one person or agency bears total responsibility. Thus, depending on which official, politician or agency representative one communicates with, each can blame the other and deny any and all culpability for the annual carnage. (Even the slaughterhouse operator told the woman to "call the DEC." Essentially that is what they all do -- tell questioners to call someone else.) USDA WS has even claimed that their "directives" come from the federal Department of Interior. The main culprit in this government entrenched bureaucracy is however, the much discredited USDA Wildlife Services as they are the people who prepare various Environmental Impact Statements (EIS) to "sell" the concept of lethal culls to politicians and leaders of other agencies who apparently don't bother to question or protest. Reality is that capturing molting geese who cannot fly is easy "make work" that results in lucrative governmental contracts and guaranteed employment for many people over periods of years. Moreover, considering that USDA WS has had decades to perfect their animal roundup and exterminations skills (as well as the justifications for them) they can be considered "expert" in the fields. Nevermind that there have been endless complaints against WS's brutal methods and killing of endangered species, non-target animals and even pets over the years. So much so, that some newspapers (including The New York Times, Sacramento Bee, Washington Post) and Washington legislators have called for investigations into the practices of WS but so far none have borne any results. The bottom line is that this is a job retention program that is built largely out of one spectacular media event in January of 2009 ("Miracle on the Hudson") that had absolutely nothing to do, in reality, with the charge and actions of this entrenched, largely tax-funded, federal agency that acts more like a private wildlife extermination company than a responsible governmental entity. Captain Sully's plane was simply the golden apple for USDA WS or more accurately, "the gift that keeps on giving." The two misfortunate geese that the airliner collided with that fateful day were not even NYC resident geese, but rather migratory visitors from Labrador, Canada. Protest as we may, the clandestine slaughter of our natural wildlife continues with nary a word about them in the press. One can speculate that the massacre of our NYC geese will continue as long as there is easy money to be made from them and/or there are simply no more geese remaining to be captured and killed. As I put the finishing touches on this, one day following the roundup of 50 pathetic geese from Jamaica Bay Wildlife "Refuge," I wonder if those geese are still sitting terrified and cramped in those bright yellow crates awaiting slaughter? They flew into a "refuge" some weeks ago perceiving they would be safe during the six-week molt in which they lose flight feathers. They would have been ready to fly out on their own in less than a week or two. But, little did the 50 hapless geese know they were flying into a trap.